Pursuant to going U-pick strawberry picking this week, an adventure I got to chronicle in The Buffalo News, I made strawberry jam. Unbelievable, the feeling of accomplishment! And of having the right garage sale equipment. 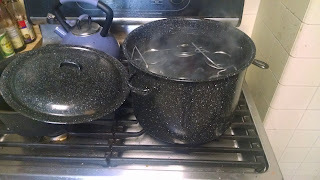 I have garage sale tongs for the jars and a garage sale funnel to use to pour the jam into the jars, and just recently I acquired a special mini-canner that is good for jars that are pint-sized and smaller. That is it sitting on the Bosch up above. All this while Mick Jagger and Charlie Watts were touring the Darwin Martin House right down the street. I take time out of my life and my kitchen only for Leonard Pennario so I did not join them. 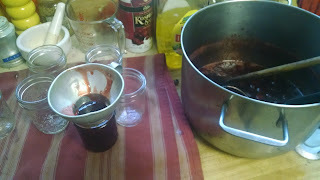 End result, as we say here in Buffalo, I now have six half-pints of jam. The satisfaction (speaking of the Rolling Stones) is unbelievable! I used this Martha Stewart recipe, just strawberries and sugar, beautiful and simple. It took a while to find just a basic recipe. A lot of online recipes had too low an amount of sugar. "I wanted to be healthy," people write. Fie! The science of canning is such that you need a certain amount -- a large amount -- of sugar to preserve the jam right and get the right texture. And as long as you are not piously going to eat your strawberries plain, let us not be naive, jam is the least of the evils. It is one of the few things in my life that illustrate the principle of everything in moderation. You have a spoonful on your toast, big deal. Not like that ice cream I made with the strawberries that did not go into the jam.